You will be charged as soon as the manufacturer receives this drop-ship order. This item is not available for purchase online. Please call us at 800.606.6969. 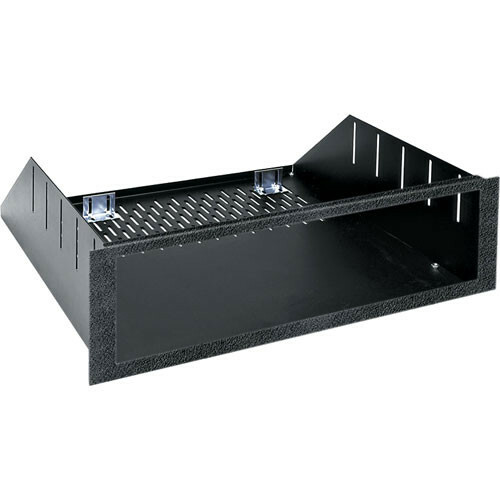 The RSH-4S Custom Rackmount Enclosure (Black Textured Powder Coat) from Middle Atlantic is a flexible solution that lets you mount virtually any non-rackmount component in a standard 19" rack or enclosure without making any modifications. The solution is made possible by custom cutting the face of the rackmount unit to work perfectly with the piece of equipment that you specify. The result is a neatly trimmed installation, with a snug fit and no gaps. Middle Atlantic has more than 8,000 components in its measurement database that can be matched with this unit. A ventilated bottom on this unit ensures adequate cooling. The included rear brackets prevent the mounted component from sliding out the rear of the enclosure. Note: This is a custom unit that must be ordered by phone. Please be ready to provide information regarding the component with which you will use this rackmount unit. This flexible solution lets you mount virtually any component---even non-rackmount devices---in a standard 19" rack or enclosure, without making any modifications. The solution is made possible by custom cutting the face of the rackmount unit to work perfectly with the piece of equipment that you specify. The result is a neatly trimmed installation with a snug fit and no gaps. Middle Atlantic has more than 8,000 components in its measurement database that can be matched with this unit. A ventilated bottom on this unit ensures adequate cooling. Box Dimensions (LxWxH) 22.0 x 18.0 x 3.5"